FrameForge 3D Studio's Expansion Packs provide theme-based collections of props, characters, relationships, poses, and sets. 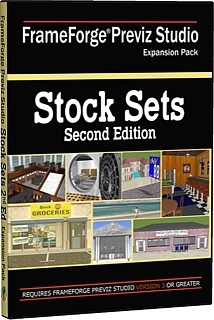 Unlike the other three expansion packs, this one doesn't add any new actors or objects, but instead supplies you with 40 fully dressed sets (twenty-four Interiors and sixteen Exteriors) suitable for immediate use as-is, or for adaptation to more specific locales. Every Stock Set installs complete with appropriate structures, furniture, fittings, and landscaping elements. Use the sets as-is or modify them to suit your needs.